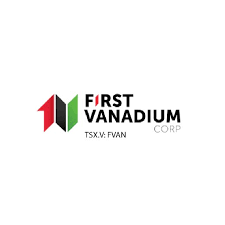 First Vanadium Corp. (TSX-V: FVAN) (OTCQX: FVANF) (FSE: 1PY) (formerly Cornerstone Metals Inc.) is pleased to announce results from the final 25 exploration drill holes aimed at extending the mineralization at its Carlin Vanadium Project located 6 miles south of Carlin, Nevada, including the thickest high-grade intercept to-date at the project returning 73.2m (240ft) grading 0.60% V2O5. A map has been placed on the Company website to demonstrate the location of the latest holes, click here to view. The diamond drill campaign successfully extended the limits of mineralization along the western and eastern edges of defined mineralization, as well as an area to the northwest. The 25 exploration drill holes were focused in 3 areas beyond the limits of the known vanadium mineralization; a 400m length along the eastern edge, a 550m x 50m area along the western edge, and a 300m x 220m area to the northwest. The majority of the drilling was successful in encountering near-surface vanadium mineralization, extending the limits of the known mineralization. One particular hole on the eastern edge returned the thickest high-grade zone to-date on the property with 73.2m (240ft) grading 0.60% vanadium (“V2O5“), starting from surface. The eastside of the mineralization was tested by five holes along a 400m (1300ft) length. Four holes successfully encountered the thick vanadium mineralized zone beyond the limits of the known mineralization with grades ranging from 0.24%to 0.79% V2O5 and tabled above. This drilling showed an average grade of 0.47% V2O5 and an average true thickness of 42.2m (138.5ft). Hole RCC18-46 was exceptionally thick at 73.15m true thickness starting at surface. Hole RCC18-56 did not encounter any significant mineralization likely due to fault-offsetting. The 300m x 220m northwest area which had been reported on in the November 7, 2018 news release, received an additional eight drill holes. Seven holes successfully encountered the vanadium mineralized zone near surface with grades ranging from 0.24% to 0.85% V2O5 and tabled above. The additional drilling showed an average grade of 0.55% V2O5 and an average true thickness of 14.4m (47ft), similar to the average results reported in the November 7, 2018 news release of 0.60% V2O5 and 18.7m (61ft) thick. Hole RCC18-51 did not encounter any significant mineralization likely due to leaching of grade in a fault zone. Holes RCC18-61 and 62 outside of the area were later found to have been drilled below the zone so did not encounter any significant mineralization. Six holes were drilled in an area 550m x 50m on the western edge of the known mineralization. All holes encountered the vanadium zone with grades near surface between 0.21% and 0.54% V2O5, extending the known mineralization. Three broad spaced holes RCC18-38, RCC18-39 and RCC18-45 drilled west of the 550m x 50m area did not encounter significant mineralization. Seven of the 25 holes were angle holes; adjusted and estimated true thickness (Est. True) of their intercepts are displayed in the tables above. The drill intercepts of the vertical holes are considered true thickness. The Carlin Vanadium deposit is considered the largest, highest grade primary vanadium deposit in North America (USGS Professional Paper 1802 Critical Mineral Resources of the United States-Economic and Environmental Geology and Prospects for Future Supply dated December 18, 2017). Vanadium is growing in importance for key industrial manufacturing sectors most notably steel and renewable energy. Today, more than 90% of the world’s vanadium is used in steel manufacturing applications. Its importance to the energy sector is also growing rapidly with more than 5% of vanadium production used in energy storage where its substantial cost and performance benefits make it an alternative choice to lithium ion in several areas. First Vanadium (formerly Cornerstone Metals Inc.) has an option to earn a 100% interest in the Carlin Vanadium Project, located in Elko County, 6 miles south from the town of Carlin, Nevada on Highway I-80. The Carlin Vanadium Project hosts the Carlin Vanadium Deposit which is flat to shallow dipping and at shallow depths, 0-60 m (0-200 ft) below surface.